The yachting scene is hotting up and competition rising. Who owns the largest yacht in the marina tonight ask yachties across the Med, eyeing up the berths as they fill up as the sun sets on another perfect day at sea. 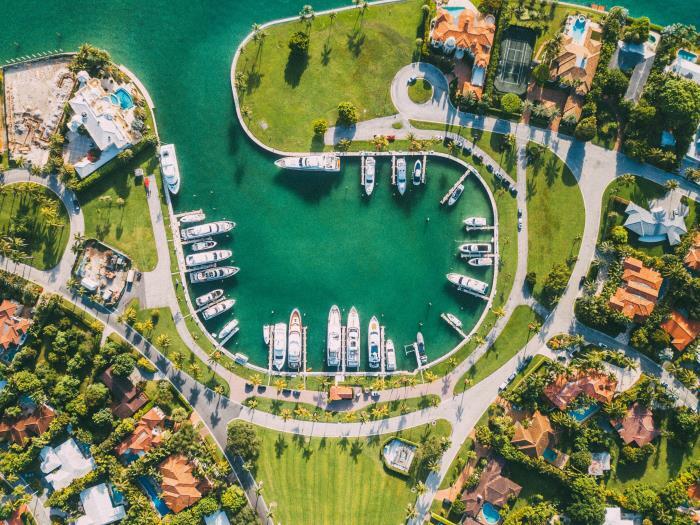 But we are talking about a new type of competition – the uber homes that surround these spectacular marinas, with their striking architecture, landscaped gardens and access to the restaurants in the local towns and cities close by. We enjoyed a visit to Montenegro a few years ago, the iconic Porto Montenegro commands a superb position and ability to berth super yachts (some 130m in length) is highly appealing, not to mention 5 star Regent hotel & apartments and cool shops within reach. The real gem for us though is Lustica Bay, a breath-taking site elevated overlooking the ocean, with marina and waterfront townhouses available complete with pretty sidewalks and courtyards. It also includes a 171 berth marina and soon The Chedi Lustica Bay hotel with 110 rooms opening in 2018 – it’s become a popular & fashionable spot in the Adriatic. Across the Med, Italy and South of France always on the radar for super yacht owners but developments in Cyprus catching the eye of yachting enthusiasts. The new Limassol Marina expertly run by Camper & Nicholsons Marinas is offering jaw dropping berths but also villas, & apartments allowing owners to park their yachts at the end of the gardens and stroll to their home, before heading to the art galleries, boutique shops and near by restaurants. This trend has been adopted by the developers behind the beautiful St Christophe Harbour marina in St Kitts, the Caribbean island twinned with Nevis. It appears here you can bring your preferred architect to custom-build a four or five bedroom property (from $1.5m, plot only of course….) and the facilities are endless. Opening later this year the Park Hyatt hotel and next year the Tom Fazio designed golf course. For us it seems the joy of owning your own yacht over a home, allows you to sail the world, chasing the sun and enjoying the winter sun of the Caribbean returning the Med as the season comes alive in June. However a beautiful home with marina access will surely generate income and it seems the agents such as Beauchamp Estates, Savills and Christies International Real Estate all believe it a savvy investment, not to mention providing St Kitts & Nevis citizenship should you part with your pennies at Christophe Harbour.